To coincide with the release of Intel's new 8th Gen Core processors for desktops, MSI has launched a bevy of new motherboards based upon the Intel H370, B360, and H310 chipsets. In a press release forwarded to HEXUS, MSI lists about 30 new motherboards based upon these new chipsets, and you will find lots of choice whether you are a value customer, a gamer, or a pro user. For a summary of the features of the respective Intel 300 Series chipsets please take a quick look over the introduction of our Asus ROG Strix B360-F Gaming (Intel B360) review, published earlier today. All of the new motherboards launched by MSI today are less featured than the overclocking friendly Intel Z370 boards that we saw introduced for enthusiasts last October. However the new mainstream and value boards based upon the Intel H370, B360, and H310 chipsets may be enough for you in terms of high-speed I/O lanes, expandability, and USB port provision - and save you buckets of cash. MSI highlights a trio of motherboards from the near-30 launch roster today. First of all we are presented with the MSI H370 Gaming PRO Carbon with concept car styling, RGB illumination via MSI Mystic Light, and a black matt carbon design ethic. MSI reminds us that Mystic Light is both a standalone technology and supported by other brands such as Corsair, CoolerMaster, and Kingston. Thus it can help provide a great synchronised PC lighting experience. 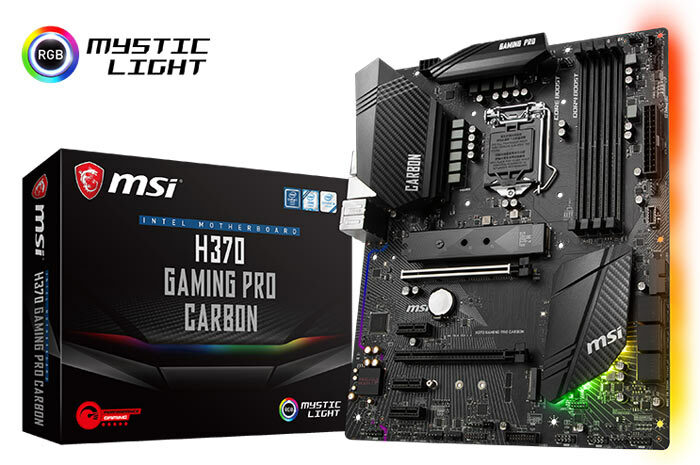 Considering more practical features, the MSI H370 Gaming PRO Carbon boasts MSI's Twin Turbo M.2 slots with the patented M.2 Shield v2 thermal solution. In addition to providing Intel Turbo USB 3.1 Gen2 connectivity MSI's board is said to be able to enable even faster transfers thanks to MSI exclusive X-Boost. 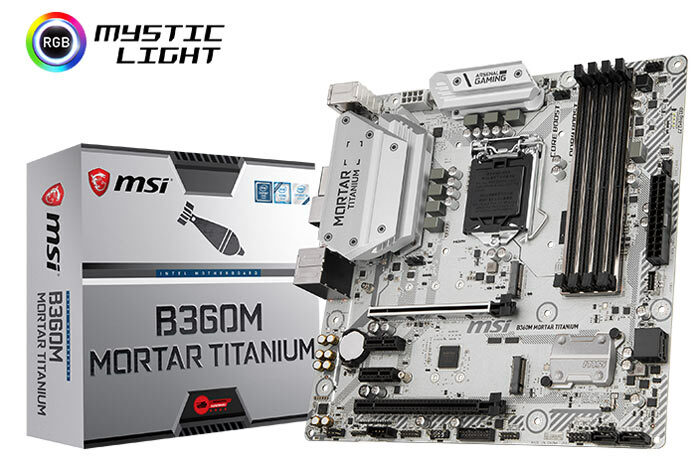 The next featured motherboard is the MSI B360M Mortar Titanium. As you can see below, this design combines a military design concept with titanium-scheme look and feel. On the topic of looks, again we have RGB lighting present, and MSI has designed a (take a deep breath) customised sticker area for you to personalise this motherboard. In more practical features the extended heatsink design of the MSI B360M Mortar Titanium is said to cope ably with the power demands of the top-end 8th gen processors from Intel. It is said to ensure that thermal issues will be nullified. Last but not least, Core Boost is claimed to deliver optimised power to the CPU with pin-point precision. 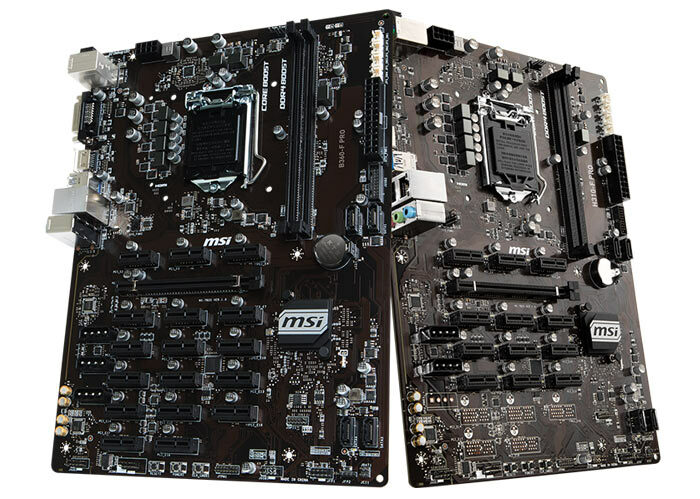 MSI turns its focus to cryptocurrency mining with its B360-F PRO and H310-F PRO motherboards. These boards support up to 18x graphics cards (B360-F PRO) and 13x graphics cards (H310-F PRO) for maximum GPU abuse. A number of interesting supporting design decisions and technologies have been implemented by MSI in its mining boards. First of all it endeavours to make usre you don't run into problems with power delivery. For example the MSI B360-F PRO supports up to 5x 24 pin power connectors and there are 4x adapters in the box for dividing power among GPUs etc. A mining BIOS with built-in slot detection is installed, MSI has enabled diskless boot for better economy and security and other tools allow users to manage mining machine activity without screens. For further details on all the new products launched today head on over to the MSI motherboards products page and select the chipset on the left side menu to filter for the boards you are interested in. There are also filter buttons for features like Gaming LAN, Mystic Light, Nahimic Audio, and so on.